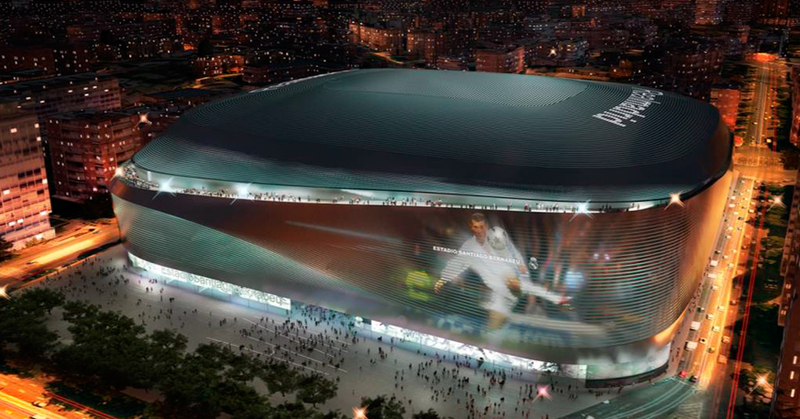 INES will take part in the remodeling of the Santiago Bernabeu Stadium in Madrid. This project seeks to reestablish the arena as a worldwide sporting landmark. 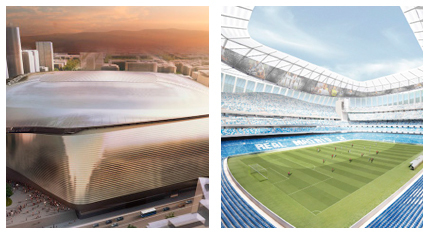 This new design includes the construction of curved asymmetric steel façades surrounding the old structure, a newly installed retractable roof, the enlargement of the stadium capacity, the construction of a shopping and leisure center, a hotel and an underground car park. All these interventions are fully integrated in the urban landscape. A key factor in the construction management is to carry out all tasks without interfering in the current operational use of the stadium. As a result of optimizing the structure, the order of the elements has been changed, having first the vertical structure and then the horizontal elements. In both cases, the new layout allows to reduce the amount and the size of the structural elements. The new mullions are aligned to the existing concrete ribs being the distance between them maximum 8m.The transoms will follow the geometry of the fi ns and each of them will support 2 louvers. Wind surveys have been carried out to analyze the aerodynamic performance of the existing structure. These surveys focused on the characterization of local winds and the generation of currents inside and within the surroundings of the stadium. It is foreseen to develop a similar study upon the new geometry of the future Santiago Bernabeu, aiming to optimize the aerodynamic behavior in comparison to the existing structure. This study will be more exhaustive including the analysis of aerodynamic effects upon newly designed structural elements such as the retracting roof.